Looking for some FREE design help? Use the contact form below to tell us about your project! *Are you building or remodeling? Have you ever built or remodeled? *Who is your contractor, or is this a DIY project? What wood species of cabinetry are you looking for? What color of cabinetry are you looking for? What door style are you looking for? What shape is your kitchen laid out in? What shape do you wish your kitchen be laid out in? What type of floor is currently installed? Do you plan on replacing the existing floor? If you plan on replacing the existing floor, what type of floor will you be installing? Have you formulated a budget for your project? If you have formulated a budget, what is your price range for the project? 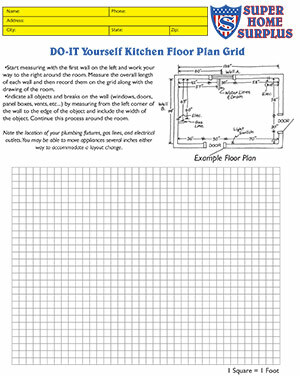 Please, print out the Do-It Yourself Kitchen Floor Plan Grid and draw your kitchen using the example floor plan as a guide. Once you have finished, please upload your plan below and we will get started designing your dream kitchen! Below are some PDF files that should get you started. After filling them out, either send them back using the form below or drop by your local Super Home Surplus store! And remember, it’s FREE! Need help? Check out our YouTube channel for advice on how to measure your kitchen!